Leaders and innovators in employee retention strategies. No download, no install, and fully customizable. Talk to real live retention experts when you need them. ExitPro was designed the way people really think and how organizations really work. ExitPro automates the employee separation process for you. From confirming an employee’s resignation, providing compliance forms, to collecting keys, materials, automobiles, credit cards, laptops, or more. You will know that your organization disabled system access, login rights, payroll, benefits, email, phones, and everything else needed to offboard staff. ExitPro “puts an end to the loose ends”. You can manage all the variables in your organization’s employee separation policy, allowing your team to get it all done, and get more done, in less time. Wow, we really have thought of everything. Go ahead, call now, try and stump us. ExitPro enables you to respond to your employees’ changing concerns faster. You can make key decisions to modify your retention strategies and prevent employee problems before they start. No more listening to rumors or wondering why employees leave. 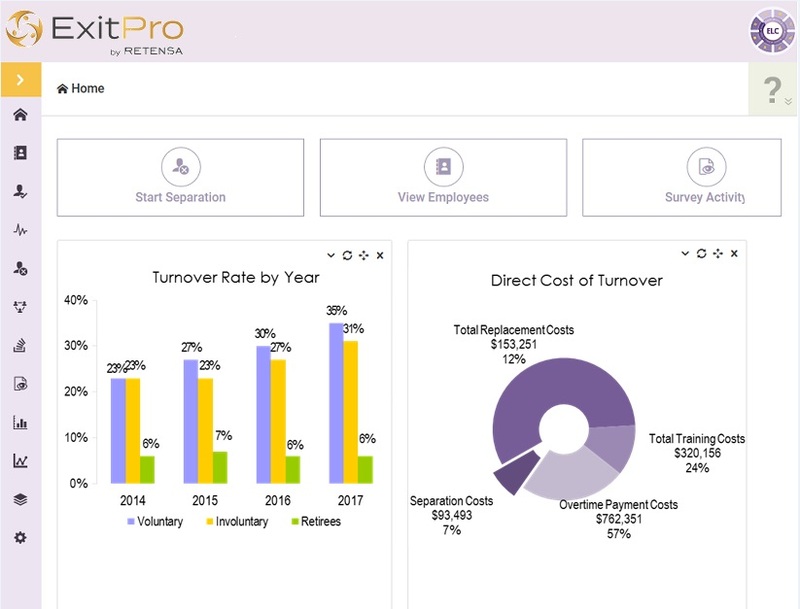 ExitPro organizes all your important employee turnover rates in one place, giving you easy access and accurate insight into the complete picture of your workforce. ExitPro can also help you correct employee data, navigate Succession Planning, access your Alumni network, and much more. Think about it, has anyone studied retention as much as Retensa? We know our stuff, contact us and see. Let’s talk about how ExitPro will provide the insights you need to TAKE ACTION. ExitPro is an online application that gathers and distributes insights which you can share with anyone in your organization, regardless of geographic location. They don’t even need to log in. (Really? Say that again). That’s right, most users get what they need Direct-to-Inbox. Some people may have to login sometimes of course, but what our clients wanted was to keep it simple and so we did. Most users review and act on separation tasks in real-time from emails they receive. ExitPro’s quick and efficient separation management and exit interview software saves you time and increases completion rates. ExitPro works everywhere the Web is which means no download, no installations, or look for anything. It comes to you. Deliver task notifications to responsible parties and track the completion of each step of an employee’s separation. Schedule and send reports and exit interview responses with the click of a button. ExitPro allows you to schedule reports to inform management, HR, key department heads, or branch offices of employee separation trends. For example, say you want female versus male exit interview responses every 2 weeks? It’s yours. You want sales force separations on the 1st of every month? It’s yours. Weekly, Monthly, Quarterly, by any demographic or title, location, department, yeah, it’s yours. Getting excited? Contact us, we get excited about this stuff too! Legal compliance can be complex and time consuming. Therefore it is even more critical for your business to document all separations and organize legal records. Documentation can be helpful in reducing risks to your company especially if you are later faced with an expensive lawsuit by an employee who is no longer in your organization. The lawsuit could claim discrimination, sexual harassment, occupational health hazards, or other workplace issues. A centralized offboarding system, like ExitPro, helps you efficiently manage your employees’ resignation and termination records in one location. The platform automatically generates and e-mails clear and concise resignation forms to employees when they start the separation process, confirming their resignation. Note: Neither ExitPro, nor any software, is a substitute for sound legal advice from a qualified licensed professional. ExitPro, and its owners, cannot protect anyone from being sued or guarantee victory in any case and no warranty is implied or provided. ExitPro delivers rich, detailed, and customizable graphical reports, instantly. Three, maybe four clicks, done. Due to years of experience with all kinds of industries, organizations, and executives, we pre-built the most important reports for you. These ready-to-print reports provide you with the insights you need to take action. ExitPro reports are Microsoft Office and PDF compatible, hence it gives you the option to easily export, view, and share information in spreadsheets, tables, or rich executive-ready graphs and charts. Above all, ExitPro clients have the insights to make decisions in hours instead of weeks.